Be creative with a plethora of details. I want to hear all about your day in the City in the Clouds. This entry was posted in Creativity, Writing and tagged creativity, thoughts, writing. Bookmark the permalink. My first day in this city was very great, and I’m, so excited about it. I want to go to school; I want to make new friends in this beautiful world. Today I woke up so happy because today was my first day in this school. This morning was very cold, so my mom told me to put on my sweater, and I went to put my sweater ; when I was going to school, I noticed some stuff that I wasn’t sure what it was, and when I got to school we had mechanical teachers. When I got to my house I told my mom what I saw in the way to school, and I told my mom too all the friends I had made in my first day of school. It was a fantastic day. I live in New York City in the sky cool place to be. Wow what a big city, here I go one day living in the sky. this is so white what is this it fell so good I am looking for some food and I can’t find none wait were is my family . o well better sleeping till I want to perfect no one to bother not cool . I wake up in the morning brush my teeth. I am looking for my family and I can’t find them, wait a second where is everybody else this is not where I live what happened to our neighborhood. I am wondering when we moved. Wow there is a big nice looking fridge should I touch it o well wow when I open the fridge there was lots of thing to eat I mean LOTS. I start to eat a ole lot I didn’t care about no one being here. This is like the best day of my life no one around thank you. I think in the different world my little cousin will start bothering me a whole lot and I will have to wake up to walk my dog and see lot of people at school etc. . 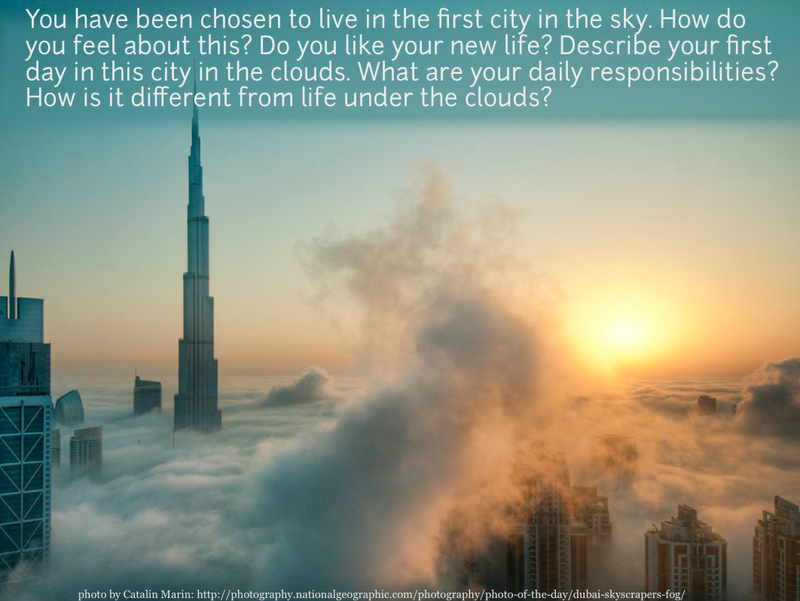 I have been chosen to live in the first city in the sky and i feel really special that they chose me to be the one living in the sky on top of those comtable clouds.I also feel like a new me because its different up here.The diffrence about living in the clouds and on the ground is that ,on top of the clouds we dont get the rainy days nor the to hot or to cold days we just have the right temperature .On the ground he walk alot and in the we just play all day long jumping in the clouds.We can always sleep very comtable on the clouds.And on top of the clouds i can see all the view down in the ground.And on the ground i really dont have a fabulious ! !view like i do from up in the sky(:!!!!! My day in cloud city was terrible. There was no smell.Everything was so quiet when i tryed to drive a car i kept on crashing into buildings. I could bearly see were i was going the clouds were in my way.There was no departments or house just gigantic buildings. Cloud city was not fun or exiting. Everything smells like sunshine here. People from all around the world are here. some with green eyes, some with blue, some with brown.. Its simply amazing! And its just so beautiful. when i got here i thought i would die with excitement. It doesnt have the hustle and bustle of a big city. Its quiet and peaceful. I feel as if i am so high that i can look down and see heaven. i really love it here. Today was very different. I was invited to live in the new city, the “City in the Clouds”. I was fascinated by the name and instantly fell in love, before I even got there. I had to have alot gumption in order to accept it, so I easily accepted it with alacrity/earnestly. When I first arrived in the city, I was astounded!! I ambled around the city for several hours lingering around very tall skyscrapers. I felt as if I was floating in the air and walking on clouds(well, I kind of in a way I was because the city is called and is actually The City In The Clouds). There were invisible portals that leaded you to anywhere you wanted to go and the only problem was that I often ran into them and ended up getting lost and discombobulated somewhere in a building. There were also hoovercrafts and all sorts of flying objects eveywhere! I really like it here, and my cohorts decided that this would be the perfect place for us unless we, of course, made a nemesis. My daily responsibilities are just as simple as to HAVE FUN!! We have nothing to worry about because everything is basiclly done for us by people who volunteered to work for the people that run the city. The only difference from under the clouds is that life in the clouds brings us more fun, joy excitement, and things to try. Also, one thing you have to watch out for is thnderstorms. Overall, I think I’ll live a good life IN THE CLOUDS! !